The federal hiring freeze is stoking anxiety that the Labor Department may not have the resources to adequately investigate alleged workplace wage violations. The DOL hasn’t disclosed how it will implement President Donald Trump’s Jan. 23 executive order to halt hiring, nor has the department said how its Wage and Hour Division will be prioritized in the next budget. Still, former WHD officials from both Republican and Democratic administrations say the freeze could create a problem if WHD investigators and their supervisors flee en masse and the agency can’t fill vacancies. “I think the WHD does need to have a vibrant complement of investigators to be an effective protector of the workplace, both for employers and employees,” Alfred Robinson, an acting WHD administrator under President George W. Bush, told Bloomberg BNA. “You have to be careful that the hiring freeze doesn’t compromise” the division, Robinson said. The WHD field staff is comprised of more than 1,200 non-managerial workers, including around 1,000 investigators responsible for protecting workers’ wage and leave rights. Those investigators are tasked with looking into a wide range of alleged minimum wage and overtime pay violations. About one-quarter of WHD field employees are eligible right now to retire or take an early out, according to DOL bargaining unit statistics reviewed by Bloomberg BNA. Career civil servants of all ages often consider an exit during the presidential transition. But the Trump administration’s talk of shrinking the federal workforce and reducing pay and benefits makes the potential for departures acute right now, said the president of the union representing half of DOL employees. “You’re not going to have as many people out there enforcing child labor, minimum wage, overtime and family and medical leave. People are going to have less protection under the law,” said Dennis DeMay, a former WHD investigator who now runs the union representing some 8,000 DOL field employees working outside of Washington, told Bloomberg BNA. Ex-WHD directors recall similar operational challenges during the Bush administration, when slashed enforcement budgets led to caps on travel and prevented complex investigations. They’re taking a wait-and-see approach on how the Trump hiring freeze shakes out, but the former officials said enforcement activities and compliance assistance may deteriorate if WHD isn’t prioritized. The WHD has a fairly consistent attrition rate through the years—about ten people per month either retire, quit or otherwise leave, said Michael Hancock, who was the division’s assistant administrator for policy through 2015. “If you can’t replace those people, then it’s a matter of time before the losses are so significant that it impacts the ability of the agency to fulfill its mission,” Hancock, now with plaintiffs’ law firm Cohen, Milstein, Sellers and Toll P.C. in New York, told Bloomberg BNA. It’s not just a surge in investigator retirements that would spark angst. Wider enforcement gaps could emerge once veteran investigators are promoted to fill the slots of retiring managers, said Robinson, now a shareholder with management law firm Ogletree, Deakins, Nash, Smoak & Stewart P.C. in Washington. District directors “may be the essential cog in the whole operation,” said Hancock. “There are a lot of those people who could, if they choose, retire.” The directors assist investigators with cases, and interpret and communicate new guidance from the national office. Even some younger investigators hired in the prior administration may consider leaving a Trump administration if they believe the White House doesn’t support the WHD’s mission. Early signals indicate the president and his DOL appointees will try to revise many of the regulatory and enforcement initiatives investigators carried out the past eight years. “I would say that the bigger question right now, frankly, is whether career people are going to want to stay under this administration where they feel it’s particularly hostile to career federal employees,” Christopher Wilkinson, who also was a regional solicitor in the Bush administration, told Bloomberg BNA. Wilkinson now represents employers as a partner at Orrick, Herrington & Sutcliffe in Washington. Restructured retirement plans also give investigators more flexibility than in years past, easing their path out the door if they so desire. DeMay said his members are generally keeping their heads down and fulfilling previous objectives until told otherwise. A Return to Bush-Era WHD? Answers about how the WHD will operate under Trump aren’t likely to materialize until the Senate confirms a new labor secretary and other key personnel. That process is off to a slow start as Andrew Puzder withdrew from consideration to be secretary of labor. That means the first indication about the administration’s plan for WHD isn’t expected until the White House’s initial budget request, sometime this spring. The best guess at what might happen with the division’s staffing levels might come from looking back on what happened the last time Republicans controlled the executive branch. 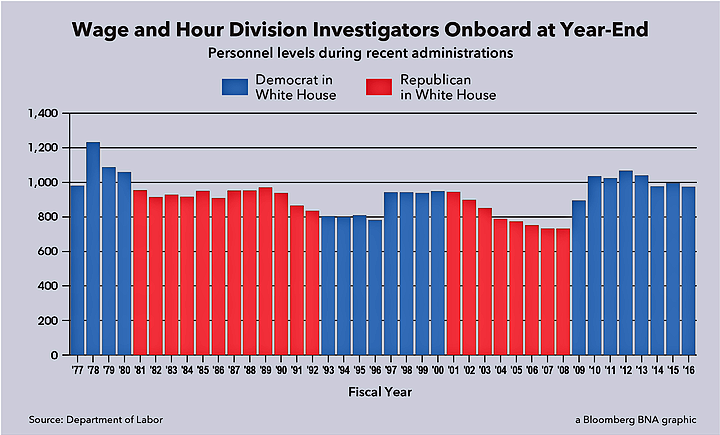 The number of WHD investigators declined in every single year of the Bush administration, from about 950 in 2001 to 731 in 2008 (see graphic). Congress transferred enforcement appropriations to the DOL’s Office of Labor-Management Standards (OLMS), to bolster investigations of union officers for alleged corruption. That pattern reversed under President Barack Obama, when the DOL had about 1,000 WHD investigators each year, along with a shaved OLMS budget. Several members of the Trump DOL transition were ex-Bush OLMS employees. They may look to restore priorities to the 2000s. Robinson said he hopes the hiring freeze keeps the investigative unit staffed at about 900-1,000. Anything below that could compromise the agency, but if the manpower level is maintained, then the freeze “will help the incoming administration develop an understanding of what its responsibilities are and whether there are there better ways to allocate resources,” he added. The new freeze reminds Hancock of the Bush years when he was a career bureaucrat and witnessed a “degradation of the agency’s ability to do its work.” Investigators were unable to travel as often or as far, and the qualify of their cases suffered, he said. Hancock recalls worker complaints languishing and overworked managers unable to provide adequate oversight. This time, the hiring freeze probably won’t bring a rapid return to a bare bones wage and hour enforcement apparatus. DeMay said WHD field staffers are unlikely to leave until they receive more information about what the freeze actually means and who will be running the division.